The vyAkhyAnam for mudhal thiruvandhAdhi was divined first by nampiLLai and later on, by parama kArunIkar (the most compassionate) periyavAchchAn piLLai. appiLLai, one of the ashtadhikgajangaLs (eight protectors, like elephants, in the eight directions) of maNavALa mAmunigaL wrote arumpadha urai (explaining the meanings of difficult terms) based on periyavAchchAn piLLai’s vyAkhyAnam, in order to bring out the meanings more clearly. This translation takes into account both these pUrvAchAryas’ vyAkhyAnams. nampiLLai’s vyAkyAnam had not been known to many until Dr. M. A. vEnkatakrishNan swAmy located the copy of the manuscript for the first thiruvandhAdhi at the Government Oriental Manuscript Library and later found a copy of all the four thiruvandhAdhis (of the mudhal AzhwArs and thirumazhisai AzhwAr) at the Academy of Sanskrit Research at thirunArAyaNapuram. We are deeply indebted to him for bringing out a book of these vyAkhyAnams along with his lucid explanation. emperumAn, the consort of SrI [mahAlakshmi], who is unbiased and is an ocean of all auspicious qualities, resides in nithyavibhUthi (paramapadham or SrIvaikuNtam), constantly served by nithyasUris (the permanent dwellers of nithyavibhUthi), whose knowledge never shrinks [blessed with deep knowledge about bhagavath vishayam (knowledge about emperumAn) and their own servitorship]. While he should feel happy and contented with all these, emperumAn wishes to reform the jIvas (bound souls) in samsAram (materialistic world) who are the exact opposite of nithyasUris, being ignorant, not knowing that they are equally qualified to serve emperumAn, constantly engaging with samsAram with their deeds. Though emperumAn gave them [after deluge] physical forms and SAsthrams so that they could know about him and approach him, they ignored SAsthrams and went about in their own ways, getting deeper and deeper into the quagmire called samsAram. emperumAn then incarnated himself as various avathArams such as SrIrAma, krishNa et al and tried to correct them with his physical form [beauty], deeds, upadhEsam (spiritual discourse) etc. But they did not bother about these and went about their engagement with worldly pleasures. Just as hunters use deer to catch deer, emeprumAn then decided to send the first three AzhwArs after his avathArams to correct the jIvAthmAs. What is the greatness of these three AzhwArs? Due to the causeless mercy of emperumAn, they were endowed with deep knowledge of and devotion towards emperumAn; similar to nithyasUris, they were having profound experience of emperumAn from the time they were born; it is as if mukthars (another class of jIvAthmAs who had got liberated from samsAram and had attained mOksham or SrIvaikuNtam) with their profound knowledge of emperumAn had come to samsAram to live here; these three AzhwArs did not turn towards samsAram at all; they were celebrated by nammAzhwAr as in thiruvAimozhi 7-9-6 “inkavi pAdum paramakavigaL” (the great poets who composed sweet verses) and by thirumangai AzhwAr as in periya thirumozhi 2-8-2 “senthamizh pAduvAr” (those who sing in pristine thamizh). Just as an ocean is spread equally everywhere, these AzhwArs had the knowledge to enjoy simultaneously and equally all the five forms of emperumAn viz. 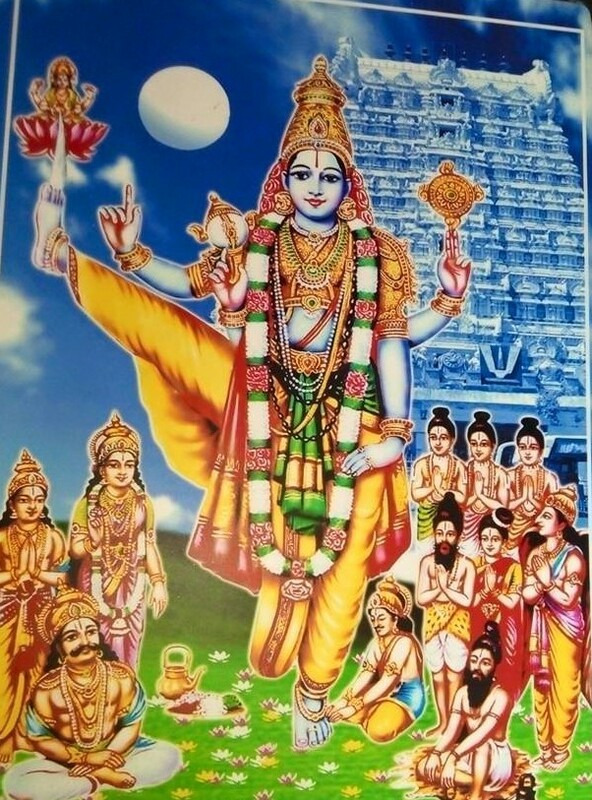 param, vyUham, vibhavam, antharyAmi and archchai (supreme form in SrIvaikuNtam worshipped by nithyasUris and mukthars, his form in thiruppARkadal worshipped by celestial persons, his form when he incarnated as SrIrAma, krishNa et al, his pervading form inside all AthmAs and his physical archA (deity) form in various dhivyadhEsams respectively). Just like a river in spate flows ferociously everywhere, but still stagnates in a few places which are deeper, these three AzhwArs, enjoying emperumAn in all his five states, were greatly engaged with the experience of thrivikraman (the form of emperumAn when he measured all the worlds) among the vibhavAthArams and thiruvEnkatamudaiyAn (in thirumalai) among archchai forms. They could not engage with samsAris, who, despite having the knowledge of emperumAn, did not bother about going towards him for succour. thirumangai AzhwAr says in his periya thirumozhi 11-8-9 “Anvidai Ezh anRadarththArkku ALAnAr allAdhAr mAnidavar allar enRu enmaththE vaiththEn” (I did not deem as humans in my heart, those who were not devotees of krishNa who subdued seven bulls). These AzhwArs also did not consider such persons as ones with knowledge of emperumAn. kulasEkarAzhwAr in his perumAL thirumozhi 3-8 says “pEyarE enakku yAvarum yAnumOr pEyanE yavarkkum” (those who do not believe in emperumAn and submit to him are fools to me and I am a fool to them). bhUdhaththAzhwAr, in his iraNdAm thiruvandhAdhi 44 says “siRandhArkku ezhu thuNaiyAm sengaNmAl nAmam maRandhArai mAnidamA vaiyEn” (the divine name of emperumAn is a source of huge support to jIvAthmAs who believe in him; I do not consider those who forget this, as human beings). Thus these AzhwArs avoided being with samsAris who are inimical to emperumAn and stayed mostly in forests among plants and trees, remaining for the night at the place where they reach in any given evening and were going about their lives, without meeting each other. One day, by chance, all three of these mudhal AzhwArs reached thirukkOvalUr. Since it was raining heavily, with strong breeze, poygai AzhwAr entered the veranda space of mrugaNdu maharishi’s ASram and lay down there. After sometime, the second, bhUdhaththAzhwAr knocked on the door. poygai AzhwAr replied that there is space for only one person to lie down. bhUdhaththAzhwAr responded saying, “if there is space for one to lie down, there would be enough space for two to sit; please open”. poygai AzhwAr thought that samsAris do not like another person’s breath on them and hence the person who is knocking cannot be a kEvalar (one who believes in kaivalyam, enjoying his own soul) . He must be someone special, and hence he opened the door. Both of them sat down in that space. The third AzhwAr, pEyAzhwAr, knocked on the door now, asking for letting him in. The first two AzhwArs said that two of them are sitting and there is no further space to accommodate a third person. pEyAzhwAr said that in the space where two persons are sitting, three can stand. The first two AzhwArs thought that the third person is no ordinary person as ordinary persons do not like to jostle with other samsAris. All three AzhwArs now stood in that small space. Seeing the three AzhwArs together, emperumAn, who wished to remove his tiredness of having to follow each of them separately in their journey through forests etc, now decided to come amidst them with his consort, SrIdhEvi. This was in line with poygai AzhwAr’s 86th verse in mudhal thiruvandhAdhi (neeyum thirumagaLum ninRAyAl …….pUngOval idaikazhiyE paRRi ini”. The three AzhwArs realised that suddenly two more people had come amidst them and wanted to see who they are. poygai AzhwAr, found out through his knowledge of parabhakthi (knowledge of emperumAn) that all the chith and achith (the sentients and the insentients) in the world are under the control of emperumAn. Utilising the earth (with its cause and effect relationship) as lamp, he divined the first thiruvandhAdhai starting with the words “vaiyam thagaLiyA”. The next AzhwAr, bhUdhaththAzhwAr, utilising his paragyAna knowledge (gyAnam / knowledge matures into bhakthi / devotion) divined the next thiruvandhAdhi, “anbE thagaLiyA”. The third AzhwAr, pEyAzhwAr, then divined the third thiruvandhAdhi, “thirukkaNdEn” using his paramabhakthi knowledge (devotion maturing into sAkshAthkAram or ability to see emperumAn). Since these three states of gyAna, bhakthi and sAkshAthkAram (knowledge, devotion and ability to see emperumAn) develop in the same person, in succession, we can say that the three thiruvandhAdhis (composed by the three AzhwArs) were indeed one composition. This is similar to our considering the vyAkarNa sUthram, vruththi and bhAshyam of pANiNi, vararuchi and pathanjali respectively, to be one work though composed by the three persons, since they talk of the same subject, grammar. All the objects (chith and achith, the sentient and insentient) belong to emperumAn and he is their lord. Thus the first AzhwAr lit the lamp of knowledge. With the help of devotion that he attained with this knowledge, bhUdhaththAzhwAr lit a lamp. With the help of sAkshAthkAram (ability to see) which resulted from this bhakthi, pEyAzhwAr was able to have the vision of emperumAn, Apart from enjoying whatever they had seen, the three AzhwArs composed their experience as three prabandhams so that the world can also enjoy what they had experienced and enjoyed. The reason for their using terms such as thagaLi (lamp holder), ney (ghee, i.e. clarified butter), viLakku (lamp wick) is to establish that the world is made of different components and thus establishing that the world is a created object. If it is created there must be a creator behind it and if it is variegated then the creator should have wondrous abilities. Here it says that emperumAn, holding Sankam (conch) and chakram (disc) is the creator. While explaining brahmasUthram 1-1-3 “SAsthrayOnithvAth”, SrI rAmAnuja has condemned those who establish emperumAn through anumAnam (conjecture). That being the case, why is it that emperumAn has been established through conjecture here? manusmruthi in 12-106 says “Arsham dharmOpadhESancha vEdhASAsthrA’virOdhi nA I yastharkENAnusandhaththE sa dharmam vEdha nEthara: II” (only the one who inquires about vEdhas which have been seen by rishis (sages) and about smruthis which instruct about dharmam (virtuous deeds) through logical arguments without being at variance with vEdha SAsthrams, knows about dharmam; the others do not). Thus, since maharishis (great sages) such as manu et al have mentioned that one can use non-contrarian logic to know the meanings of vEdha SAsthrams but not contrarian logic (contrary to vEdham), and this is also accepted by sUthrakArar (sage vyAsa), there is nothing contrary to brahma sUthram in AzhwAr using conjecture which is not at variance with vEdha SAsthrams, to establish emperumAn. bhAshyakArar (bhagavath SrI rAmAnujar) in his SrIbhAshyArambam says “nyAyAthukruhIthasya vAkyasyArthaniSchAyakathvarath” (only that sentence which has been blessed by nyAya (propriety, fairness etc) has the capacity to establish meaning). We shall next enjoy the first pAsuram of mudhal thiruvandhAdhi. This entry was posted in iyaRpA, mudhal thiruvandhAdhi on June 6, 2017 by T N Krishnan.